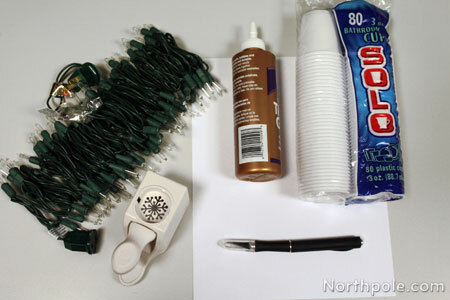 Transform a strand of Christmas lights with mini plastic cups and paper. That’s right—with only cups and paper! We used white plastic cups (the 3 oz. size) found in the paper products aisle at the grocery store. Depending on where you shop, they might also be called bathroom cups. We tested these lanterns with clear cups, but they didn’t diffuse the light when turned on. 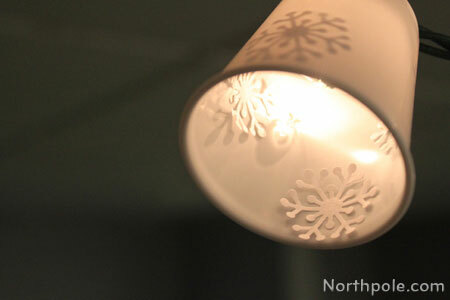 The lights inside the white cups illuminate the opaque plastic nicely, casting subtle shadows from the snowflakes. You cannot tell that these are cups once the lights are on! Strands of lights usually come with 100 mini lights, and you only need to cover about half of the lights with cups. You can also use these lanterns as tealight holders—with flameless candles only. Lay cutting mat on a flat surface. Remove about 50 cups from packaging and place on cutting mat. Using the X-Acto knife, cut a small “x” on the bottom of each cup, cutting one cup at a time. Repeat for all 50 cups. Set cups aside. Using the snowflake punch, cut snowflakes out of the white paper. 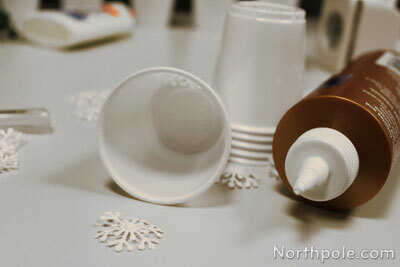 Apply a small amount of glue to the center of each snowflake. Press onto the inner side of cup. Put 3–4 snowflakes in each cup. Set cups aside. Note: Make a little assembly line by adding glue to several snowflakes at one time, and then quickly stick the snowflakes to the cups. Repeat for each cup. DO NOT stack cups together because the glue needs to dry. You may however, construct a pyramid out of the cups if you need to conserve table space. 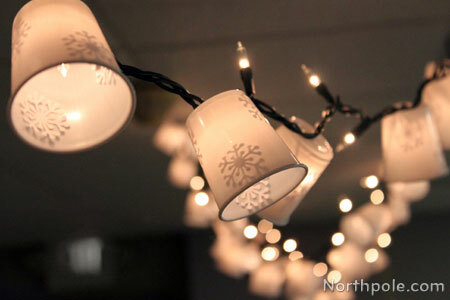 Once dry, stick cups onto lights by pushing the light through the “x” on the bottom of each cup. Add lanterns to every other light. You are finished. Now hang wherever you like! We tested these lights for 5 hours indoors, and did not have any problem with the materials overheating.